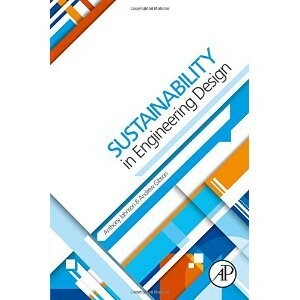 The authors are uniquely-qualified to produce such an excellent text on sustainability based engineering designs – a subject which is relatively new but is catching up very fast and needs to be popularized not only among the practicing engineers but engineering graduates. Anthony Gibson, being a Chartered mechanical engineer, has had more than 400 design projects to his credit and as an educator is responsible for the Engineering Design course in the Department of Engineering and Technology at the University of Huddersfield, U.K., whereas Mr. Gibson is the Managing Director of Segelocum Ltd -a consultancy firm which designs training programmes for business growth including environmentally sustainable designs from concept to execution. The book first introduces general concepts of sustainability with the help of several practical examples and explains how the conventional designs of some products can be transformed to create sustainable products. This involves personal experiences of the authors of designing some products. Throughout the book, authors keep the interest and attention of a reader glued to the subject by citing interesting historical developments of some products into more sustainable design of the products in question. Sustainability can be improved by the strategy of dematerialization (use of minimum material) and reduction of energy use at all stages of life cycle since any product development requires materials and energy to manipulate materials. Sustainability can be improved by recycling materials, reusing appliances, repairing components and remanufacturing. Sustainable Engineering Design is a new discipline which concerns entire design, manufacturing process and use phases of a product and includes activities like specifying sustainable materials to build a product, creating sustainable design, designing for sustainable manufacturing, sustainable use and maintenance and finally designing sustainable disposal. It covers entire activities from cradle to grave. The book is very well developed and provides an overview of sustainable design concepts and applications through several case studies and examples. The book can be used as a reference by the industry professionals learning sustainable design concepts and practical methods to create sustainable designs. The reviewer feels that this book must be read by all engineers regardless of their specializations. It should also be read by all graduating students of engineering as they would be future designers of products and systems.